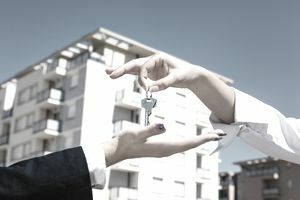 Most people—even brand new investors—are familiar with the lease-to-own strategy, also known as lease-purchase or rent-to-own. But not many people have been introduced to the "sandwich" lease-to-own approach to real estate investing. Let's say you're a real estate investor who's new at the game and cash poor. Or maybe you're an investor who has maxed out his ability to get new financing. Maybe it's a bit of both. In any case, you want to own more properties so you can lease them out for cash flow, but you purchase them outright in your current situation. That's a shame because there are so many great bargains out there with owners who are in trouble with their mortgages. So you enter into a lease-to-own contract with one of them so you can buy a property through a lease-purchase option with the owner. You pay a non-refundable lease-option fee up front and sign a three-year lease with the option to buy the property at or before the end of the lease at a pre-negotiated price. Then you would pay a monthly lease amount and gather a down payment for the exercise of your option and the eventual purchase of the home. The part of the "sandwich" lease-option strategy you might not have been exposed to is the other slice of bread. You're the one slice. Now you need the second. There's nothing keeping you from going out and finding a tenant who wants to own a home like this one but he has credit and/or cash problems that keep it from happening now. You show him the home and he loves it. He wishes he could buy it...and you tell them that he can. You execute a three-year lease with a certain lease payment. He can exercise his option to buy the home at the end of that lease at a certain price. You also tell him that he must purchase this lease-option with an upfront non-refundable deposit. The situation is the mirror image of the way in which you gained control of the home in the first place. There are two leases with you sandwiched in the middle. The trick to this purchase and rental strategy is finding the right home and negotiating deals on both sides. You'll require a greater deposit from your tenant than you paid to the original homeowner. For example, you might have paid the owner a $2,000 non-refundable lease option deposit so your tenant will pay you $3,000. You'll also need a higher lease payment from your tenant. We'll assume that the owner needed to sell or he would lose his home. You can usually negotiate a lease payment that equals his mortgage payment which is often less than the going rate to lease a home like this. You'll want a higher purchase price from your tenant. The original owner really needed to sell and he realized that a low price is better than a foreclosure. You, however, negotiate a price significantly higher with your tenant-buyer. Now you're making money three ways. Let's say that our example deal involved a $1,000 profit upfront lease-option payment, and $500 more per month from the tenant than you, the investor, are paying the owner. We'll say the selling price is $30,000 higher than the purchase price you agreed to with the original owner. That's a gross profit of $49,000 when the home is purchased/sold at the end of three years. Do some research in your area for opportunities to make it work for you. Equity or Mortgage REITs-Best for You? Can You Make More Money Renting Several Units Under One Roof?